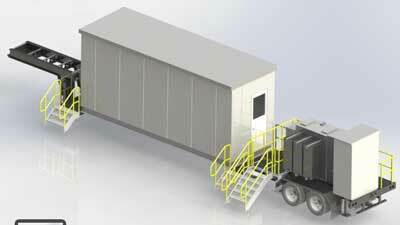 Our mobile trailer-mounted controls regulate energy supplies in the world’s most rugged and remote areas. Thanks to rapid delivery times and advanced capabilities, portable high-voltage equipment is used for much more than secondary substations and emergency relief. Modular trailer-mounted electrical houses with capacities up to 1,000 MVA and 550 kV are now used in metropolitan hubs and isolated sites that have installation challenges. Prefabricated trailer-mounted buildings are ideal for high- or medium-voltage sites where time and cost are critical. Customized solutions with turn-key availability and lower costs benefit high-voltage clients in all sectors. Modular control units and substation components can restore power following equipment failure, natural disasters and outages. During fast-track power projects, emergencies or peak usage, trailer-mounted control buildings keep the energy flowing and prevent costly delays. Off-site construction and efficient transportation options have advanced the speed and increased the benefits of fast-track power. Our flexible manufacturing capabilities support the assembly of individual or multiple trailers for isolated projects and simultaneous installations. Mobile control buildings may include switchgear, variable-frequency drives, motorized controls, cooling systems and SCADA panels that enable remote monitoring. Additional equipment can be added depending on the client’s requirements. Switchgear and controls that are mounted on a self-contained truck or semi-trailer can be deployed to most domestic and international locations quickly and without the need for special permits. Our experts integrate and test safety controls, switches and components before they leave our state-of-the-art facility in Houston. This enables the unit to be transported while fully assembled. In the field, plug-and-play electrical houses (e-houses) can be energized almost immediately. Equisales is available to arrange the assembly and deployment of mobile control buildings 24 hours a day. High-voltage clients in the gas, oil and mining industries have found innovative ways to use mobile equipment for primary power distribution and consumption. Trailer-mounted control modules can be transported to remote locations quickly and moved on demand. When conventional high-voltage equipment cannot be transported to a remote energy site, mobile units are a practical solution. In the event of an outage or blackout, mobile controls restore power quickly and protect critical equipment from future surges. Power generators and down-stream distributors frequently use truck-mounted controls and substations following severe weather, equipment failure and other emergencies. 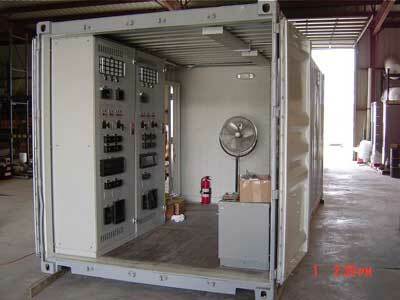 We also deliver portable units that restore power while products are manufactured or installed. If you need an emergency replacement or a cost-effective high-voltage solution, we can develop customized control buildings according to your specifications. Our electrical engineers will work with you to select a plan that meets cost, time and planning objectives. Call 713-733-3999 to request a free quote for critical projects.